The Skike Australia Victorian Ski Chase is a fun and free1 competition designed to promote participation in Victorian citizen cross country ski races. Points are awarded based on race results, but with an age handicap to give everyone a fair go. The points are also designed to favour participation over performance, so that a complete beginner could outperform Australia’s best skiers simply by participating in one more event. Most events, including the Rollerski/Skike Championships, have more than one distance included to cater for all abilities. There are some great prizes on offer including a pair of v07 PLUS Skikes, four $100 gift vouchers from Rochford Wines (near Healesville),and for U23s, cash prizes totalling in excess of $1000. In keeping with the competition design to promote participation, most of the major prizes are drawn randomly among the participants, with the more events you do the greater your chances of winning the prizes. The overall competition winners (male and female) each receive a $100 Rochford Wines voucher. Eligibility: All participants who complete at least one race. Prize distribution: Participants earn one ticket to a random draw per event (limit of two tickets from Falls Creek events). The Skikes will be drawn at a Ski Cross Country Victoria meeting shortly after the end of the ski season, and the winner notified by e-mail. Points are awarded for place and age. Place points: First place receives 80 points, second 78, third 76 and so on, with every participant receiving at least 20 points. Age points: The age points are designed to give older and younger skiers a fair go. Skiers aged between 23 and 33 receive 30 points. Age points for older skiers are 3 less than their age. Younger skiers receive 99 points minus 3 times their age. Points are accumulated for each event, except only the best two Falls Creek events are included. Prize distribution: Top twelve male and female point scorers will enter draws to win cash prizes. Depending on the amount of cash donated, there may be a prize designated for the first placed male and female participants. 1 Fees apply to enter individual events. That well known proverb: “the best laid plans of mice and men often go awry” was certainly proved true on Sunday. The inclusion of the rollerski race in the Ski Chase was to provide at least one guaranteed event that would never be cancelled due to poor snow conditions. Unfortunately, we didn't account for Storm Force winds and torrential rain/hail and sleet that brought about the inevitable cancellation. Interestingly, there didn't appear to be anyone overly disappointed about the decision, which is perhaps a reflection of how nasty the conditions were. Also, don't forget the new and improved SprintX at Lake Mountain on Saturday 25th June. Points are awarded in preference to the “main” race when multiple sub-races are included in the overall event. This means if there are 20 participants in the main event, they earn places 1—20 according to finish order, and participants in the next ranked event earn places 21, 22, and so on. The event ranking is usually the longest to shortest distance. However, for the Birkie Classic the “main” event for women has been in recent years (perhaps always) the 5 km event. Thus we have ranked the women’s events in the following order: 5 km, 10 km then 2.5 km. Attached are the interim results, which include only those people who had registered by Sunday 3rd of July. More names will be added to the results as additional people register. In the women’s competition Briana Oldis has taken the early lead, followed by Lillian Boland, Katerina Paul, Ella Jackson and Amy Beanland. All are eligible for the Under 23 cash prizes, and only five years in age separates them. In contrast 55 years in age separates the top five men (I’ll let the reader guess which is which): Kevin Tory, Will Middlemiss, Phillip Bellingham, Mark Pollack and Rod Clutterbuck. As in previous years all U23 competitors at this early stage in the competition are in the running for cash prizes. So, if you know anyone who competed who is not included on the list, give them some encouragement to register. The next event is the Snow Trek and Travel High Plains Tour at Falls Creek this Saturday 9 July. Race start 11am, 10/5/2.5 km, and new to this season a 1 km event (Freestyle technique). Remember, to maximise your points ski the longest distance that you can. Attached are the interim results, which include only those people who had registered by Sunday 10th of July. More names will be added to the results as additional people register. ski chase event 5 - bullfight charge cancelled! Any questions on the ski chase? 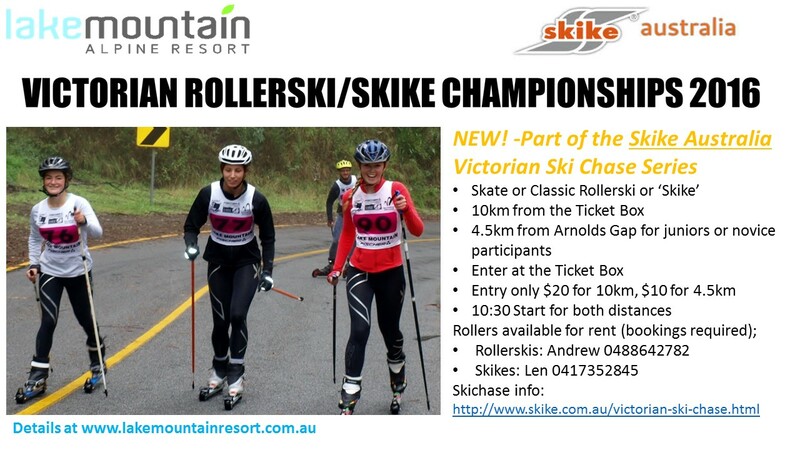 Try the information at http://www.skike.com.au/victorian-ski-chase.html or send an enquiry to victorianskichase@gmail.com. On Saturday 6th August,event 6 of the Skike Australia Victorian Ski Chase the Hotham to Dinner Plain (also known as the Pub to Pub) was held in perfect weather and very fast snow. Quite a contrast compared to the torrential rain of last year. Many thanks to Mick Sinclair and his team of helpers for once again putting on this great event. In the women’s competition Jackie Kildea and Amy Beanland have taken over the top two places after good results at the Pub to Pub, pushing the previous top three, Kat Paul, Ann Bellingham and Lily Boland, into third, fourth and fifth place respectively. In the men’s competition Kevin Tory is now being challenged by Ian Franzke for first place, and we see Ben Derrick rising into third place. Rod Clutterbuck continues his upward climb into fourth place, and Greg Beanland has jumped to fifth. On the weekend of 13 & 14 August, two Ski Chase events were held, Ski de Femme on Saturday, and the Rocky Valley Rush/Sun Valley Ramble on Sunday. While Saturday was a bit grey and wind-blown snow covered some trails, Sunday was close to perfect with fantastic grooming, under beautiful blue skies. Many thanks to Birkebeiner Nordic Ski Club for putting on these great events. As the results currently stand it looks like Amy Beanland has won the women’s competition, ahead of Jackie Kildea, Penny Grose, Briana Oldis and Lily Boland. In the men’s competition Ben Derrick has finished on top, ahead of Kevin Tory, Ian Franzke, Tommi Silvester and Rod Clutterbuck. Last night the Skike Australia Victorian Ski Chase prizes were drawn, at a meeting attended by a selection of SXCV committee members, and past and present cash prize donors. The grand prize of a pair of v07Plus Skikes donated by Skike Australia was won by Carter Bloom. The randomly drawn $100 Rochford Wines vouchers were won by Penny Grose and Charles Clarke. The first place male and female $100 Rochford Wines vouchers were won by Ben Derrick and Amy Beanland. The first place U23 skiers Amy Beanland and Tommi Silvester each win $200 in cash. We have four additional $200 cash prizes that were randomly drawn from the top 12 U23 skiers after Amy and Tommi (i.e., second to thirteenth place): Jarrah Forrer, Oliver Adams, Leila Pammer and Hayley Adams. Congratulations to the winners and a big thank you to all who competed throughout the season. Thanks to Kevin Tory and Andrew Walker for their many hours of work and organisation throughout the season. The final version of the results are at the top of this page.